The Adventure Aquarium in Camden, New Jersey, is home to two Nile hippos, Button and Genny. 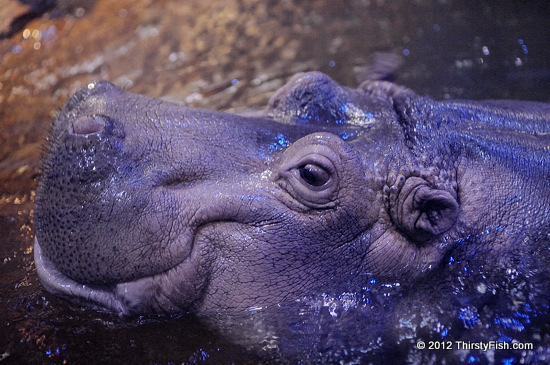 The hippopotamus has purplish-gray to blue-black upper parts, but the pictured hippo's skin color is exaggerated due to the lighting used in the "West African River" exhibit at the Aquarium. The hippopotamus is the third largest land mammal after the elephant and the rhinoceros. It weighs between 1.5 to 3 tonnes and its closest living relatives are whales and dolphins. Hippos can easily outrun humans and they are amongst the most aggressive creatures in the world. Camden, New Jersey, across the Delaware River from Philadelphia, was once one of the model industrial cities in the nation. Like many other U.S. cities with manufacturing based economies, Camden failed to adapt to a post-industrial economy and today it is one of the poorest and most dangerous cities in the nation. The city depends heavily on state aid and is commonly referenced in political circles as an example of the outcome of failing socio-economic policies. St. Augustine of Hippo (354-430) was an influential theologian and philosopher that continues to be a central figure in Christianity and Western thought. Augustine "did not see evil as demonic but rather as absence of good". His approach has had significant impact in social philosophy, ethics, and political philosophy: "Charity is no substitute for justice withheld". An idea as significant today, as it was 1600 years ago! This is the 400th post on ThirstyFish; 12,994 page views since tracking began on 6/6/2011.